The Four Seasons private residence ‘Congrejo’ is a luxury three-bedroom condominium nestled within the Four Seasons Resort, Punta Mita. This well-designed and luxuriously furnished condominium offers comfortable living, with three spacious bedrooms, two bedrooms with king beds, including a master suite with its own outdoor shower and balcony, and one bedroom with two double beds. High-end gourmet kitchen, large living, dinning and spacious outside covered terrace with private plunge pool. This property enjoys spectacular views over the tropical gardens, the warm Pacific Ocean waves crashing on the rocks in front of the Four Seasons Resort and sandy beaches. Within close walking distance to the Four Seasons Resort pools and beaches, additionally, the private Residence beach club for Punta Mita home owners and guests is a short walk away. 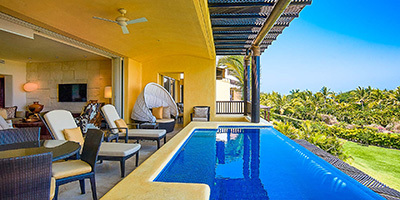 Whilst staying at Residence Cangrejo you will also enjoy the full array and access to all the Club Punta Mita amenities; two championship Jack Nicolas golf courses, world class Tennis facilities, Kupuri Beach Club, Porta Fortuna Ocean Club, St. Regis Beach Club. As a guest one enjoys the world class Four Seasons service, and has full access to the resort, pools, restaurants, games room and all amenities. We never share your information with 3rd parties.